Looking S past site of garden gate towards E side of front of house. A sunny day, a visit from John Funnel – Brighton & Hove Archaeological Society’s head of field archaeology – and good archaeology. Wow! 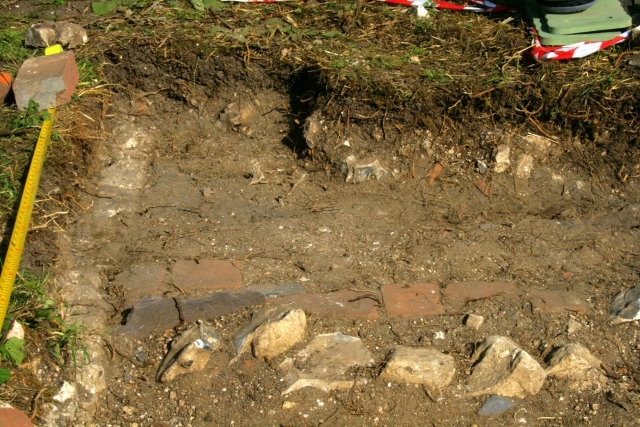 Just about all of the west side of the house has now been excavated, a small area of the farmyard, and a large part of the front garden, with its associated structures. Enough for me to feel able to make some observations on the landscape as whole. Looking E over path and front garden gateway. We finished cleaning up the inside edge of the front gateway – the main entrance to the site. The gate posts, which most likely were of brick, have been lost – possibly to the 1950’s bulldozer whose cut was here just a few centimetres above the original ground surface. The surface of the path sloped down to the east. 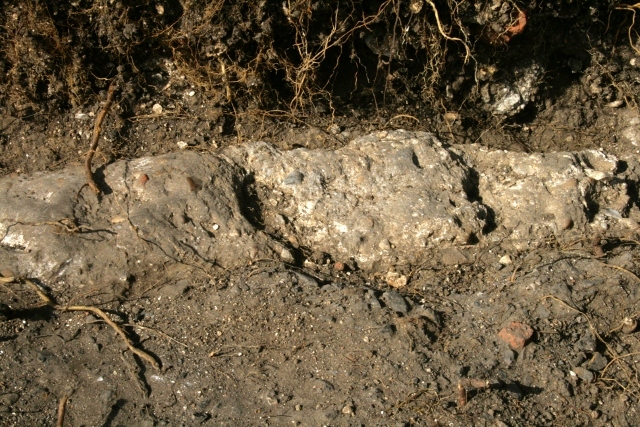 Part of the surface of the mortar threshold of the gateway was slightly below the earth surface of the path. In the above photo a darker area of the path can be seen next to the edge of the gateway. This was associated with small pieces of charcoal. Since none of the stones or finds in this area showed signs of having been scorched, this suggests that any burning in this area was not intense, and it may be that much of the ceramic, glass, and metal rubbish we have found, as well as the remains of fires, were scattered over the path to make up its surface, as well as to provide a better, less muddy, surface for walking. 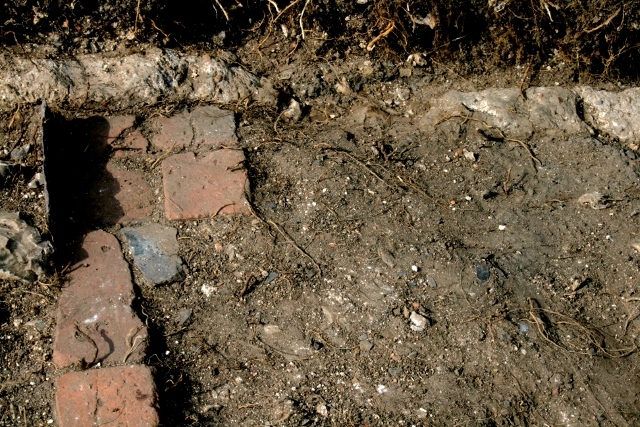 The bricks, which are likely to have originally paved the entire width of the path, were only found on its west side. These may easily have been lost due to a natural tendency for them to creep downhill. This is especially likely if the eastern side of the path had no heavy edging stones to hold a paved surface in place. The original ground surface to the east is expected to fall away fairly steeply beyond this path. The vegetable garden on the east side of the property has been reported as having been at a lower level by some of the surviving children from both the Latham and the Phipps families. The original ground surface of the site as a whole sloped downwards from west to east, though this is hard to see, both because of its covering vegetation, and because almost all of the garden to the east of the house has been covered by the large bulldozed rubble mound which consists of the demolished remains of the house, walls, outbuildings,and all the other structures in the machine’s path. When the whole site was first cleared in the late winter/early spring of its tall covering vegetation, signs of a terrace were observed at the highest, far western side of the farmyard across the former location of the stables and cattle hovel, and a lower terrace was observed at the eastern side of the farmyard, adjacent to the house. 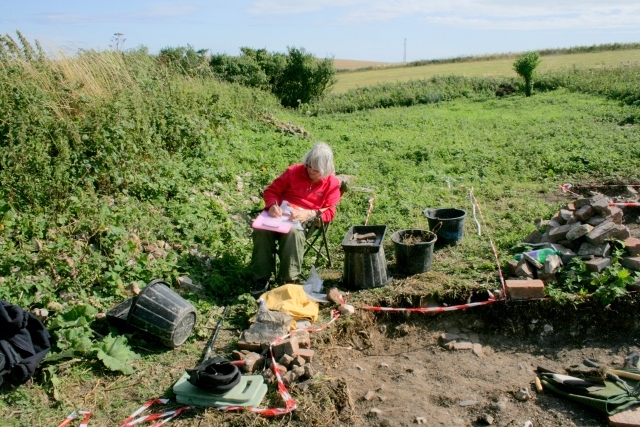 Our excavation has shown that this side of the farmyard was at a higher level than that of the house, front garden and toilet, on the western side of the wall which divided the working farmyard from the domestic part of the site. 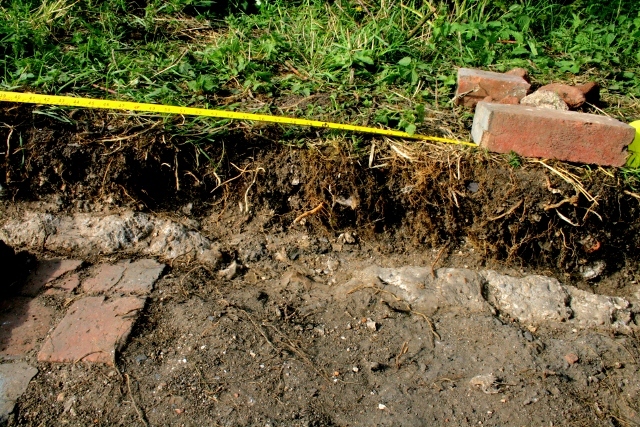 Both the platform which would have been dug for the foundations of the house and its associated structures – paths, etc. – would have had a big effect on the contours of the original ground surface – resulting in a terrace effectively being formed. Immediately to the east of the house, as was recorded above, a steep slope or bank is believed to have existed, below which was a vegetable garden, whose soil would naturally have also crept downhill – held in place by the eastern boundary wall – and so another terrace would also have formed. Further evidence for this is a dotted line shown on the 1873 Ordnance Survey map running from the approximate location of the garden gate to the north east corner of the house. The ground level of the garden next to the site’s boundary wall at its far east side, is remembered and in places can still be observed, as having been much higher than the ground surface below, at the head of the extremely steep sided Newmarket Bottom. The bulldozer, which in the early 1950’s cleaned up the shelled ruins of the site, seems to have averaged out the slope of the site. It has cut through the boundary wall between the farmyard, and the house and garden. 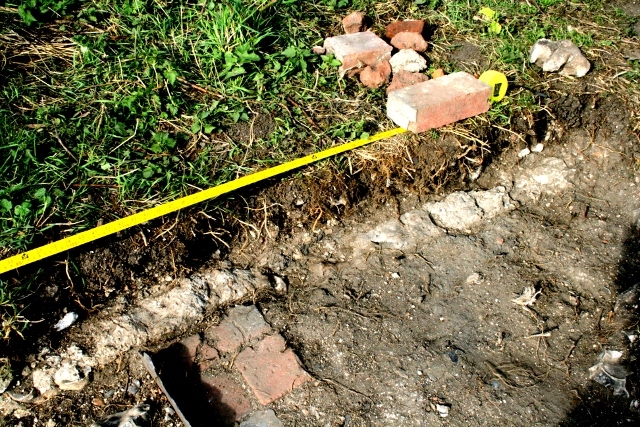 It cut through the top of the ground surface on the farmyard side, removing both the rubble from the destruction of the house that would have collapsed onto it, as well as any cobbled surface which we have been told had existed. On the other (east) side of the wall the 1940’s ground surface was at least a foot lower, and so here the bulldozer only cut through the surface of the collapsed, military ordnance destroyed, rubble. 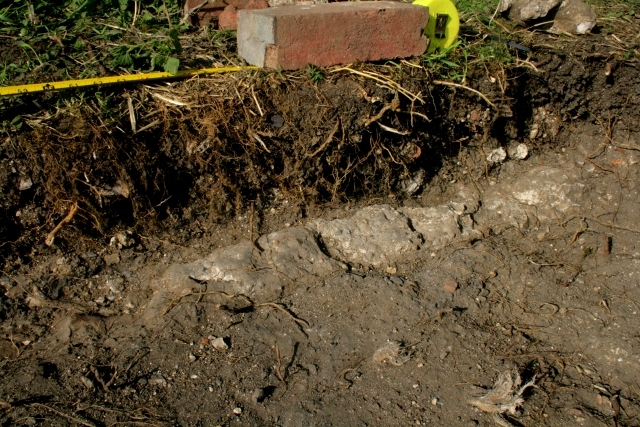 As has previously been reported, about a metre wide strip of the northern two thirds of the floor of the western side of the house, which was at a lower level than the adjacent farmyard, survived intact, but as the bulldozer continued at a downhill angle it progressively cut through the layers of the foundations below the floors and of the walls. The garden and associated features to the north of the house were all at a deeper level still, and so survived with a particularly deep covering of demolition rubble, sealing the 1940’s ground level from further damage. This area in front of the house is therefore most likely to have the best preserved archaeology. Site of front garden gate. E side of site of garden gate. The sill of the gateway was of an uneven mortar surface – part of the wall foundations – worn smooth by over a hundred years of the tenants’ feet. The light coloured parts of this structure showed no wear from peoples’ feet – so were probably the site of the pillars between which the garden gate would have been affixed. What is special for me is that from our research we know almost every one of the names of those who would have regularly passed through their garden gate. The path from the gate was opposite the east end of the house – and would have been overlooked by the washhouse/kitchen window. After about 2 yards it turned to the right towards the toilet, and after a little over 2 yards, immediately before the toilet, it again turned to the left towards the front door, which was a little over 2 yards further on. Somewhere between the house and this dog leg in the path, Peggy (my mother, who was born in the cottage)’s older siblings clearly remember a well outside the kitchen window to the left (east) of the front door. View S from garden gate towards site of E side of house frontage and possible well between Peggy and pile of bricks. So we have continued the trench from the garden gate due south, beyond the path’s southern edge, towards the front of the house in the hopes of finding the *ground level* remains of the well – remembered to have been directly outside the kitchen window. This coming Friday should be a big day in the course of the dig – the excavation of the location of the (probable) well at the front of the house. So why not join us – we should even have biscuits! No experience required. Or just come for a visit. 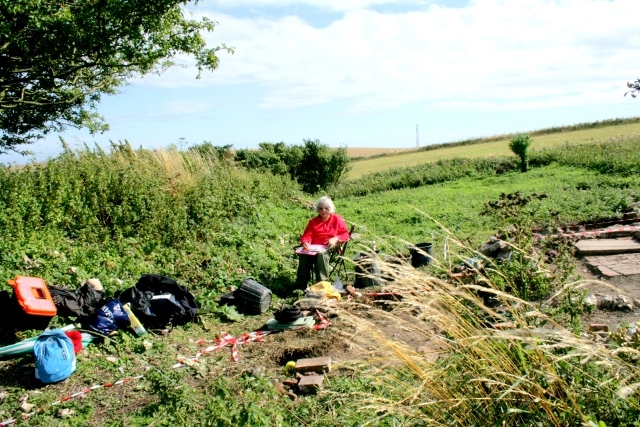 We dig Fridays & Sundays, 10am – 4pm, and meet at the car park near the junction of Bexhill Rd & Falmer Rd, just north of Woodingdean. Weather permitting!